A Cedar Falls white Christmas day in the great tradition of Bedford Falls in It’s a Wonderful Life and Dickens’ London in A Christmas Carol. Merry Christmas. 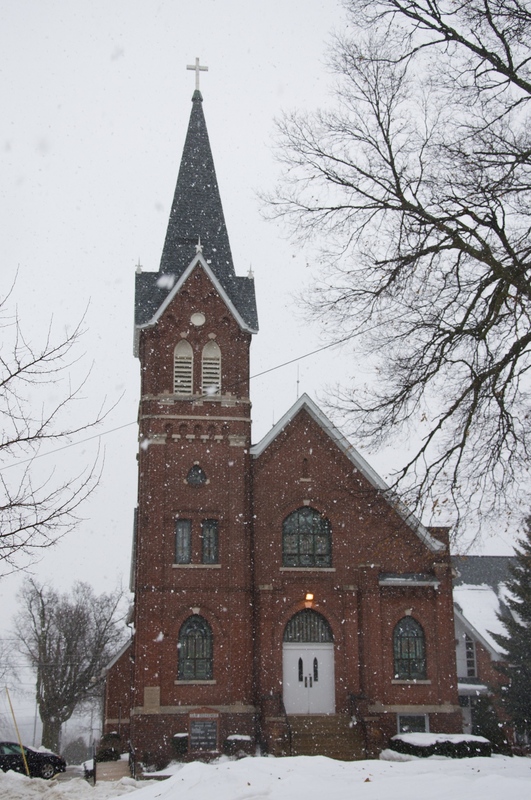 *Our Redeemer Lutheran Church located near my home. 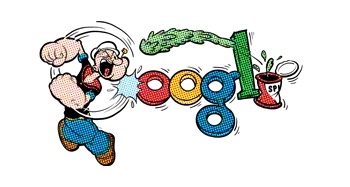 Thanks to the Google Popeye doodle I saw last night I’ve discovered one more example of a big success coming from a small place. I’m not sure if any of the decades of comic strips or the 350+ TV shows that feature Popeye explain where he was from, but Popeye’s creator had solid small town Midwest roots. E.C. Segar was born and raised in Chester, Illinois near the Mississippi River in Southern Illinois. According to Wikipedia Segar provided music to films and vaudeville acts in the local theater and for a while was a projectionist in the days before talking pictures. Segar didn’t just create a great characters, he knew how to tell stories. But it is the Popeye the Sailor that is his lasting legacy. An odd character with a couple anchor tattoos on his forearms, one-eye, a corncob pipe, a slight speech impediment and a desire to eat spinach out of can which gave him super human strength who has earned his place on the iconic fictional shelf with Mickey Mouse, James Bond and Scrooge. Back in Chester, Illinois they have a six-foot, 900 pound bronze statue of Popeye at Elzie C. Segar Memorial Park to honor their hometown boy who made good on his $20 correspondence course in cartooning. And though most people have probably never been to Chester, or even heard of it, legend has it that both literary giants Mark Twain and Charles Dickens stayed there. As you drive around your town or city today think of the interesting characters there or that have crossed your path in the past and perhaps you’ll find your Rocky Feigle who will be the basis for your Popeye. And perhaps someday your hometown will create a bronze statue in honor of your creation. Bud Sagendof who took over the Popeye comic strip after Segar died had a book published in 1979 called Popeye:The First Fifty Year which you can find on Amazon.